If you are interested in adopting one of these sweet hearts, download the form below and complete it. Please email or fax the form back to us. Once the application has been reviewed, we will contact you soon. Meet Frankie! I'm 4 yrs old and 15lbs. I'm a fun loving guy looking for a home of his own. Frankie has anxiety and may take longer than other dogs to adjust to a new situation. 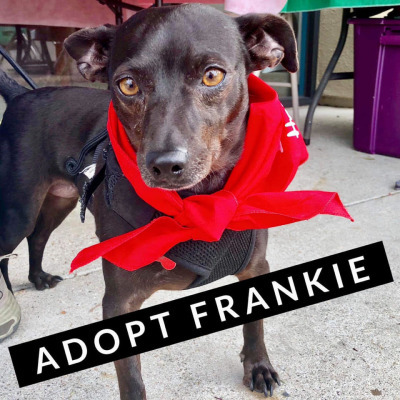 We know Frankie is a little challenging but he is very affectionate and gets along great with the other dogs in his foster home. 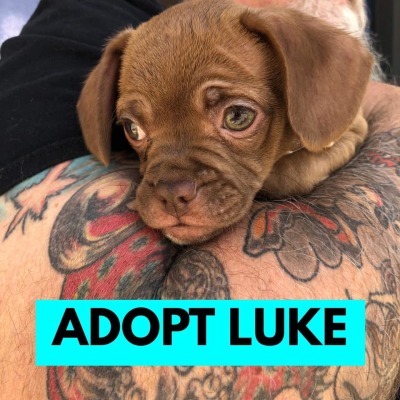 We know the right person is out there for this beautiful sweet boy. Meet Freya! I'm 10 yrs old and 5 lbs. 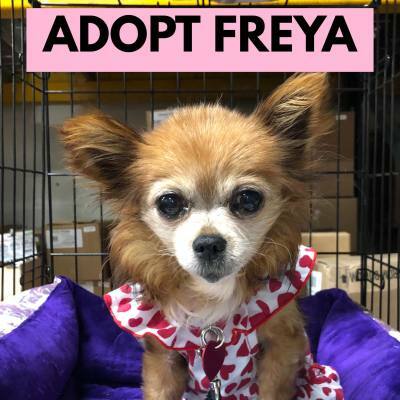 I'm a feisty senior gal looking for a home to call my own. 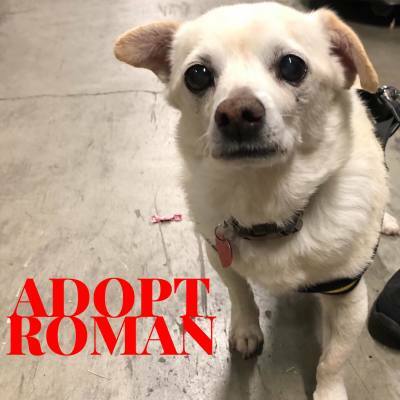 Meet Roman! I'm 8 yrs old/12lbs and just a good natured boy. I'm calm, fluffy and looking for a person to call my own. 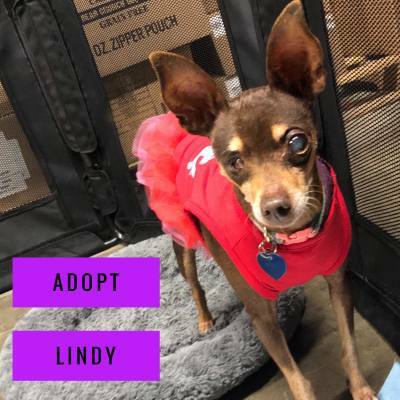 Meet Lindy! 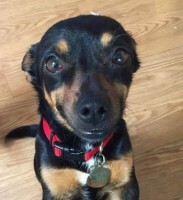 She's an 11 year old Min-Pin looking for a home to call her own. She has one shruken eye but that doesn't slow her down. 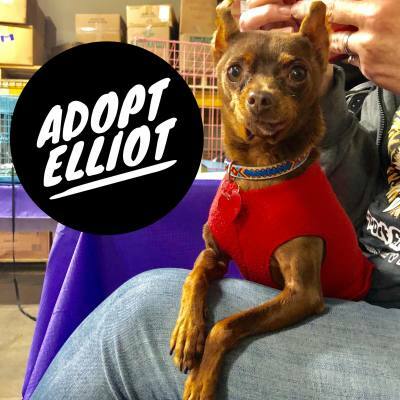 Meet Elliot! He's 12 years young and a tiny 5lbs. This tiny guy is so sweet and really loves being held. 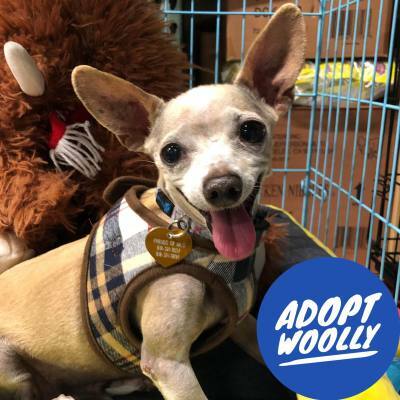 Meet Woolly! I'm 7-8 yrs old and 7lbs. I'm a happy guy looking for a lap to call my own. 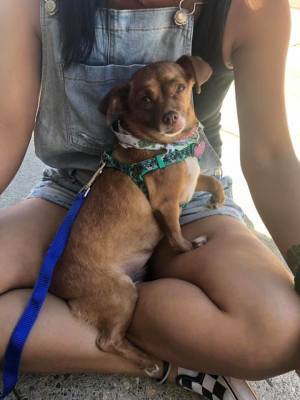 Slowly Winnie has been making progress in her foster home she is very loving but initially would cower and scream if approached or you reached for her. After a few weeks of care with Susan and Larry she is doing so much better and feeling so much more confident. She is very affectionate and likes to sit with you and cuddle. 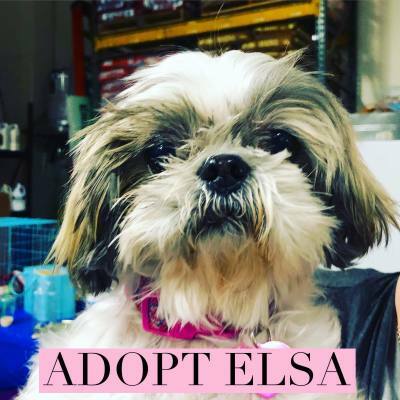 She would love a calm quiet home where she can finally be safe and stay forever. We have her on some anxiety meds and she is no longer screaming at all. 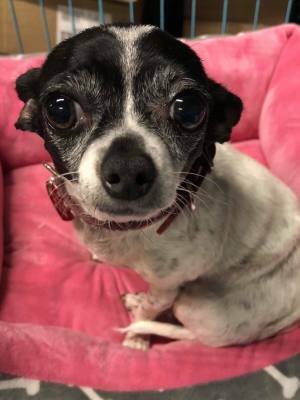 Winnie is about 6 yrs old/8lbs and is so ready to start living her best life.We just need to find her person. 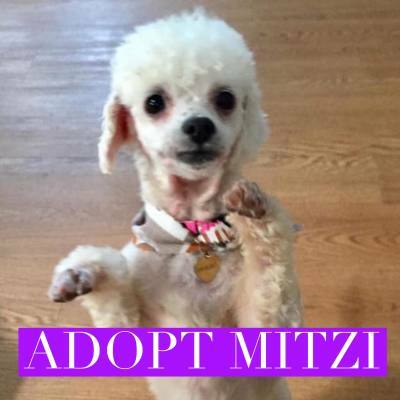 Meet Mitzi! 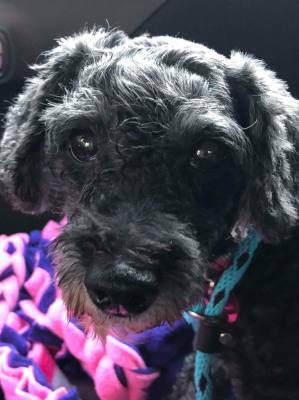 I'm a super happy 6 year old, 10lb poodle who would love to dance her way into your heart and home. I get along great with kids and dogs. 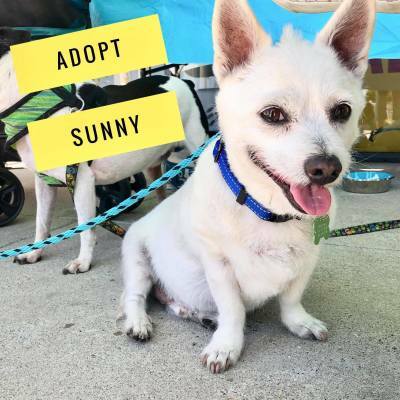 Sunny has a long story and was an owner surrender to us several months ago. 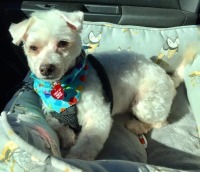 He has been in a wonderful foster and absolutely adores his foster family. We think he is so special and deserves the very best. I am so blessed that he is happy and loved and safe. Tristan is very nervous with all the new changes since being rescued from the breeder/hoarding situation. We have to take things slow with him. So as not to overwhelm him. He is a very sweet boy and the vet thinks he is 4-5 years old. 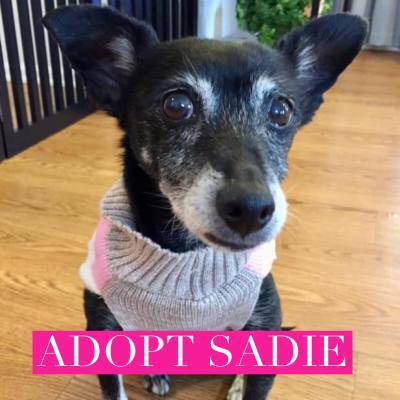 Our sweet senior Sadie is looking for a quiet home to spend her golden years. She is the most adorable sweet girl. 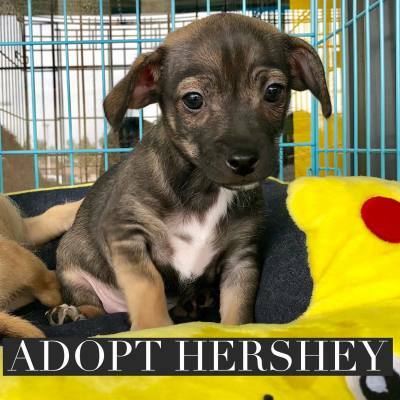 Whoever adopts this girl is getting a gem. Meet Elsa! I'm 10 yrs old and a petite gal. 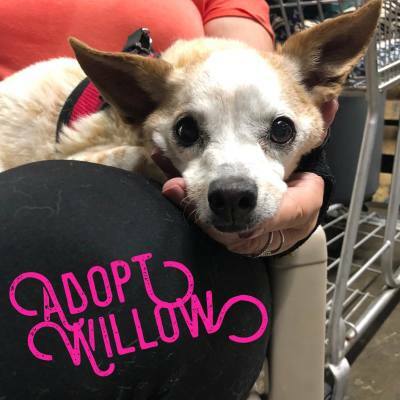 I'm a sweet senior lady looking for a lap to call my own. Meet Carys!What a funny little character this girl is! She is about 8 years old and about 8 pounds Just the cutest! These boys are 9 wks old and about 4-5lbs. Their mom was a little Border Terrier who was about 20lbs. We are not sure who Dad was but we don't expect them to be bigger then Mom. Meet Minette! She's 6 yrs old & 5lbs. She loves to sit in a warm lap and stare lovingly at you. 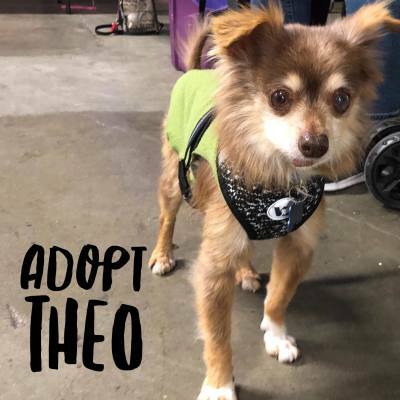 Meet Theo! He's 13 years young and about 7lbs. 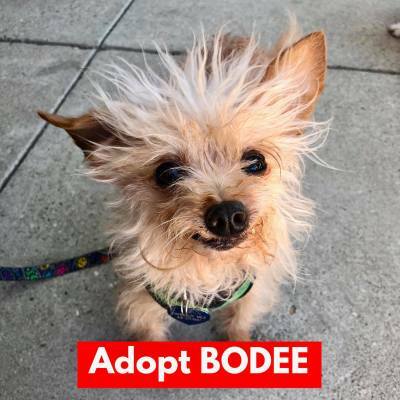 This little guy is so loving and is looking for a lap to call his own. Meet TESLA! I'm 6 months old and 10-12 pounds. I'm super playful and a very active puppy. I love other dogs and am looking for a family all my own. Meet Willow! She is 12 and she weighs about 7 pounds. She has no teeth which doesn't slow her down any. She is very people friendly and mellow. 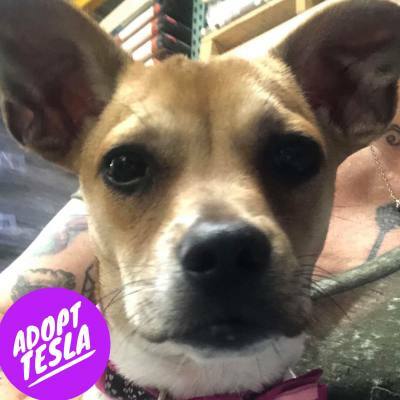 She does not like cats but can be placed with 1 or 2 other small dogs but would love to be the only one. And the day wouldn’t be complete without a tan chi!!!!  this little guy wasn’t getting much attention and he a sweet little happy fellow. 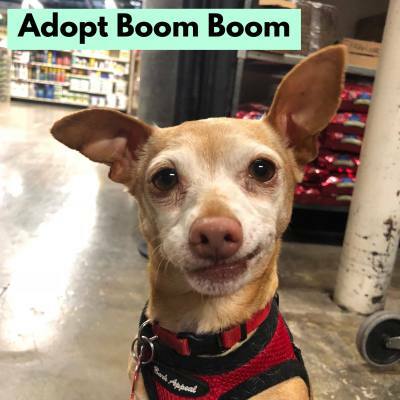 His foster mom Stephanie Hilber is calling him Boom Boom  since he is a 4th of July rescue!! He is 8 years old and has a cute derpy little mouth. Meet LUNA! I'm 6-7 years old and a small gal at 12 pounds. I have an old front leg injury that doesn't cause me pain or slow me down any and in fact we think it makes me unique. I'm full of love and looking for a person to all my own. Meet Finn! Finn is 4yrs old and 8lbs. He islooking for his forever home. This boy was horribly neglected before and now deserves a great life! Meet SweetPea! This tiny gal is 1 yr old and only 4 pounds. She's a little shy but once she warms up to you she's all love. Meet Peaches! 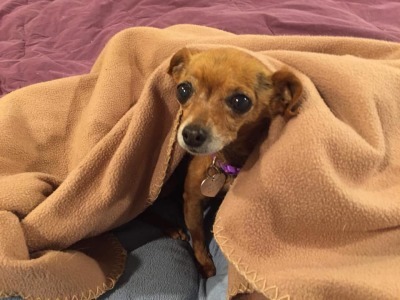 Peaches is an 8 year old 5 pound chimix who's the sweetest little girl nd looking for a home to call her own. Meet Princess! 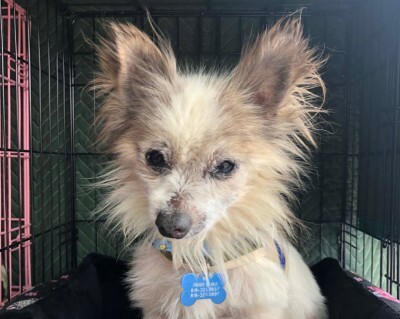 Princess is a 15 year old Pomeranian who was left at the shelter. We think she is a beauty and deserves to find a home of her own. 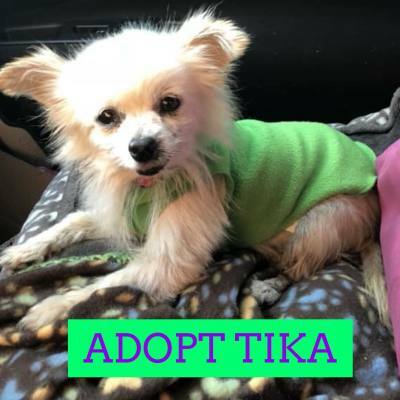 Meet Tika! 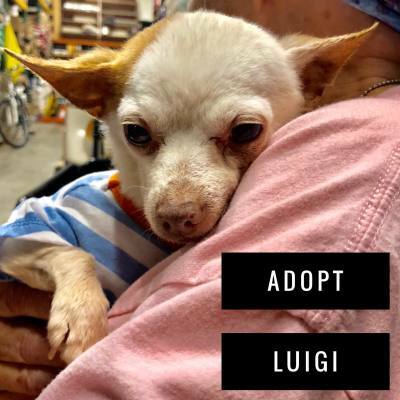 I'm a 12 year old tiny senior lady who's ready for a family all my own. 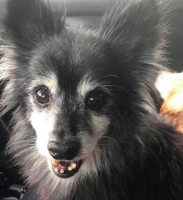 If you're looking for an amazing senior dog look no further. Meet Ariana! 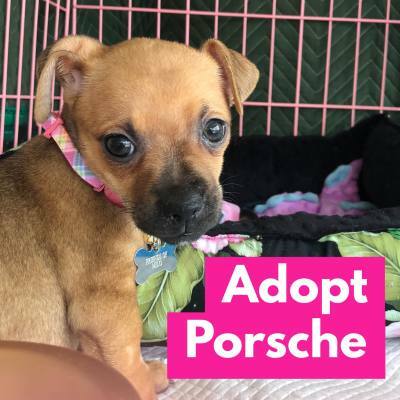 I have finished my mom duties and looking for a home of my own. I am 3yrs old and 7lbs of love. 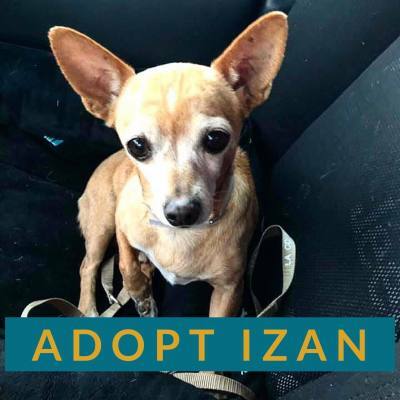 Meet Izan! Seriously someone will be so lucky to adopt this 8yr old gem! 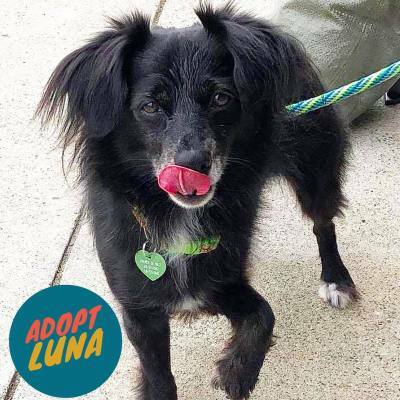 Housetrained, sweet as can be and so adorable! He even smiles! Meet Aurora. She is 9 months old and 6lbs. Ariana is their mom. 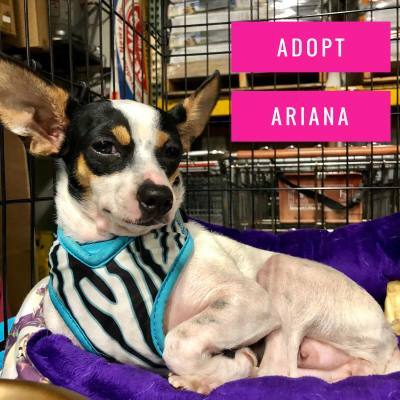 I get along with other dogs and am looking for a home of my own. Meet Poe! 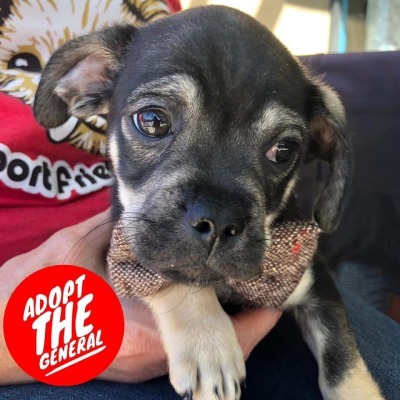 I'm a 10yr old Pug mix boy looking for a home. Great with other dogs and happy to sit in your lap. Who wouldn't want to wake up to this face every day. Meet Holly! 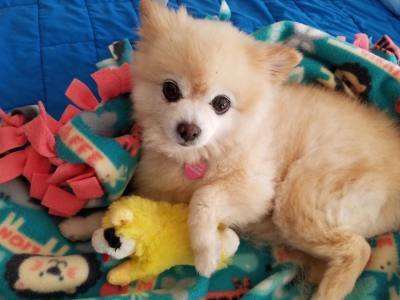 This 7yr old Pom mix girl rescued from Riverside shelter. She loves to smile and is a cuddly girl. 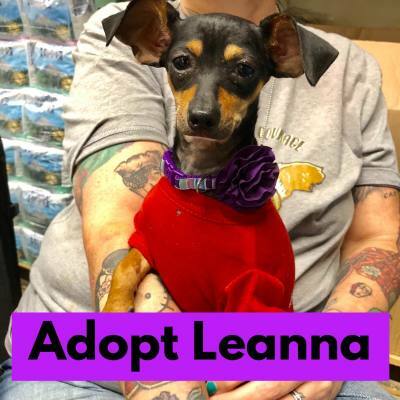 Meet Leanna. I am 9 months old and 8lbs. Ariana is my mom. I get along with dogs and I really loves cats. Meet Madelyn! 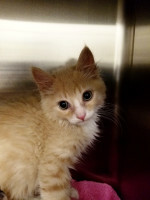 - This tiny girl is coming out of her shell and will need a patient person. Could that be you? Meet Kevin! 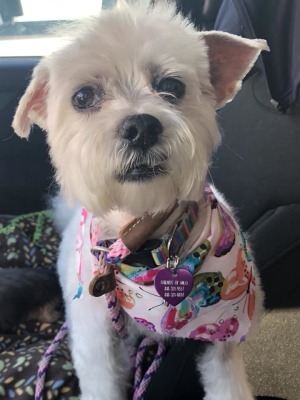 I'm a 9 yr old 9lb Maltese mix. 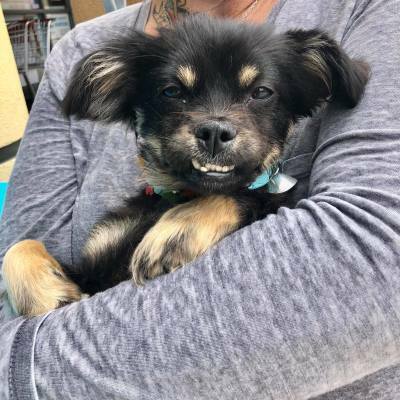 I'm a sweet boy looking for a home to call my own. Meet CODY! I'm 9 months old and 10 pounds. I'm very friendly with everyone. 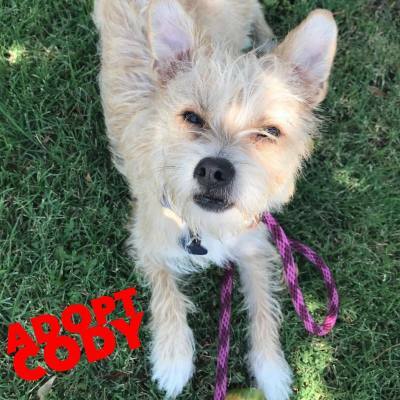 I love to play with other dogs and I would love to find a home with another playful dog. Meet Milou! She's 3 years old and 9 pounds. We think she's either a poodle or bichon mix and just full of love. Meet Poppy! 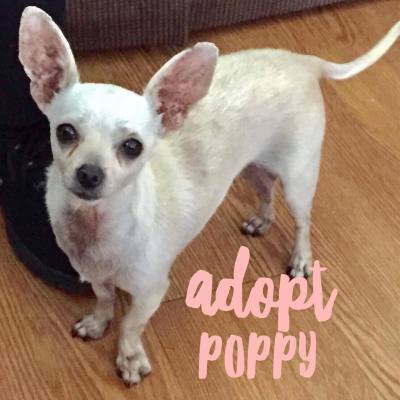 Poppy is 7 years old and was rescued with another Violette. We thought they were bonded but soon found out they were ok to be separated. 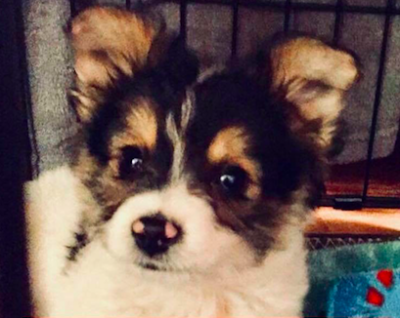 Meet Potato!!!! What a handsome and special guy he is!!! He is happy and mellow, gets along with other dogs and good with cats too. He is great on a leash and a lovebug. He is an all around good natured guy. He is 10 years young in great health. 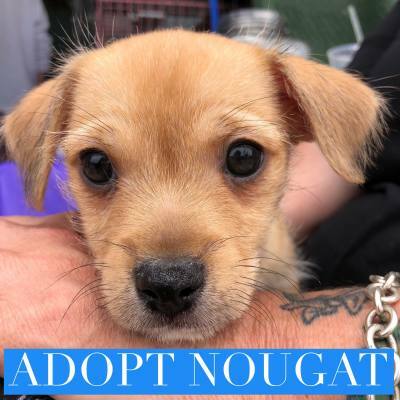 He will make anyone a wonderful companion and it will be a lucky person who makes this boy part of their family!! Meet Lacey! 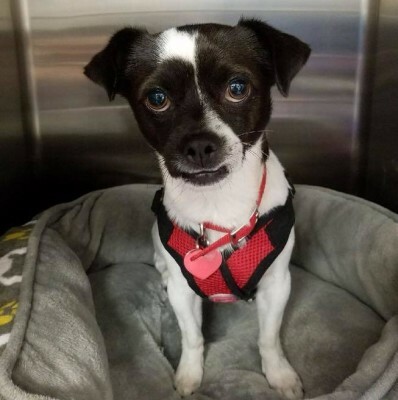 This sweet sensitive girl is 6 pounds and 6-7 years old. 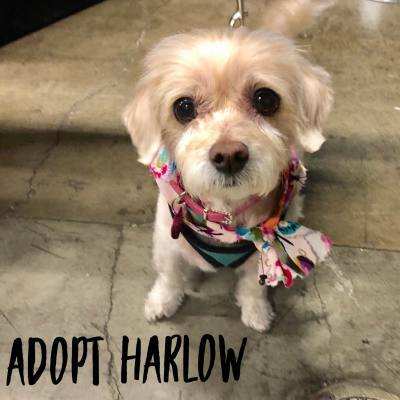 She is so pretty and has done so well greeting everyone at our adoption events with a tail wag. Meet Violette! She is a 7 year old Chihuahua. She was originally rescued with Poppy and they were thought to be a bonded pair. After some time with our foster we found out that both girls are ok to be separated. 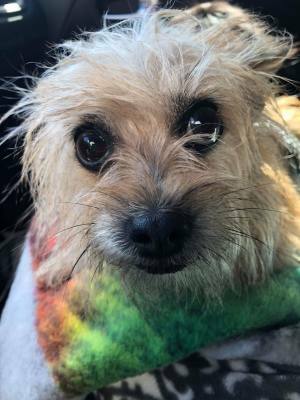 Violette is a sweet girl looking for a lap to call her own. Hi! I'm Luigi. I'm about 12 years old and a very cuddly guy. 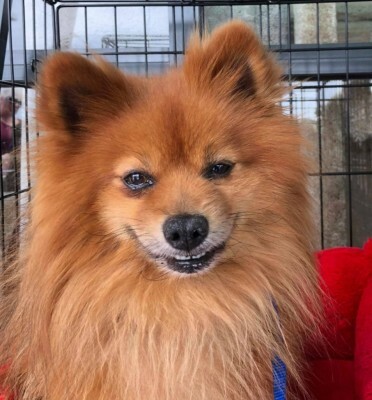 I have no teeth and am good with other dogs. I was abandoned by my owners so I'm looking for a new forever home. Could that be YOU? 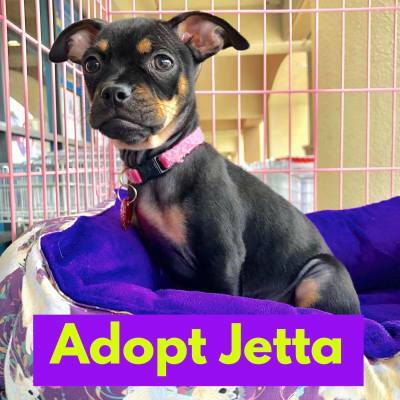 Redford is a 4 months old terrier mix puppy. He gets along well with other dogs and is currently 4lbs. We expect him to remain a small dog. 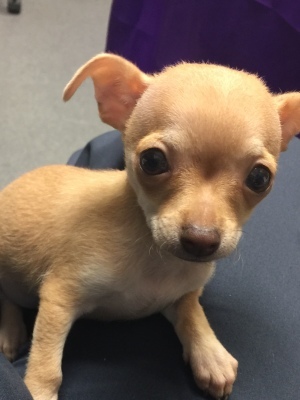 Pistachio is a Chihuahua mix puppy we rescued from the Delano shelter. He is 10 months old and 4lbs. We don't expect him to get much bigger. He loves to plays and gets along with other dogs. Its official!! 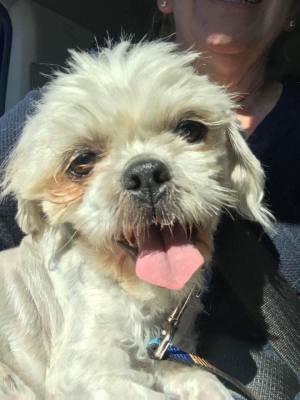 Scooter got a great report from our cardiologist and he can now find his happily ever after!!! Scooter Pie is such a fun dog!! 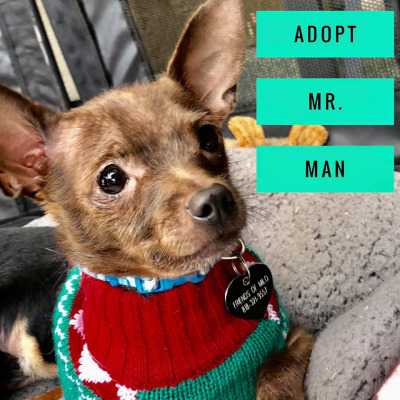 He absolutely LOVES to play with other dogs and is a super smart friendly guy. 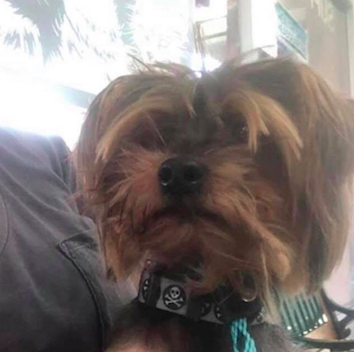 If you followed Scooter Pie’s story you know alot of folks chipped in to ensure Scooter could have his surgery! 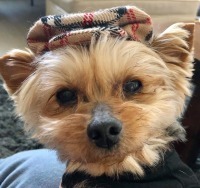 We know some folks may be intimidated by Scooter’s story but the cardiologist let them us know the surgery was a success and Scooter will go on to live a normal life!!! 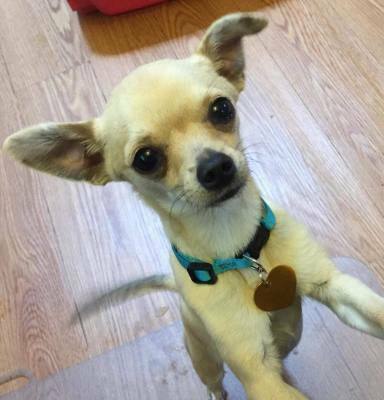 We would ideally love to find Scooter Pie a home with another small dog to play with. Scooter Pie is 12pounds and 5 years old.Scooter Pie is ready to meet You!!!! Meet Roxy. 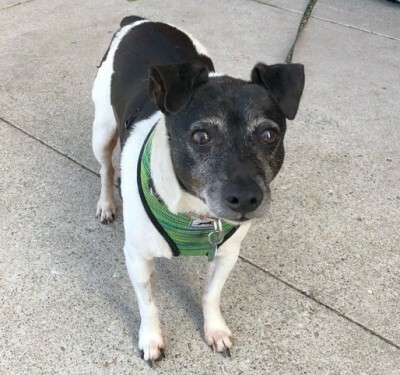 She is 10 years old and a Jack Russel Terrier mix. She is super sweet and affectionate. Good with other dogs. 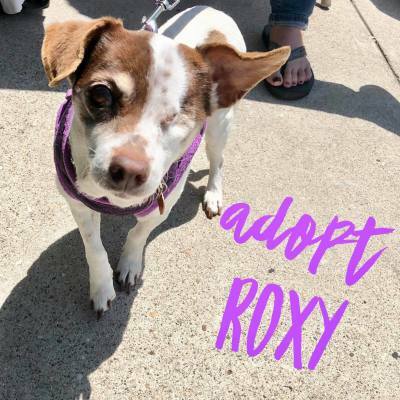 Roxy has a heart murmur andtakes one medication. 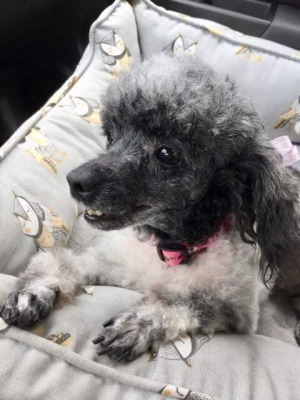 She would make a great companion for a senior person or just a calm home in general. 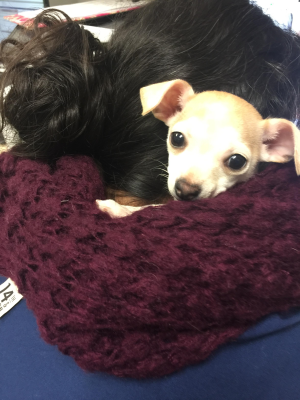 Lucille has stolen our hearts!! She is 1yr old, about 7 pounds, and the most amazing smile. She loves other dogs and her tail never stops wagging. She carries around toys bigger than her and she is a very sweet loving girl. 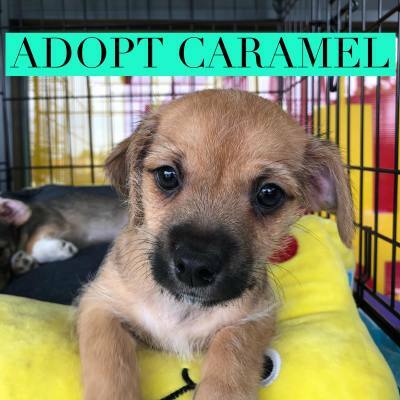 Whoever gets to adopt her is going to be VERY lucky!!! 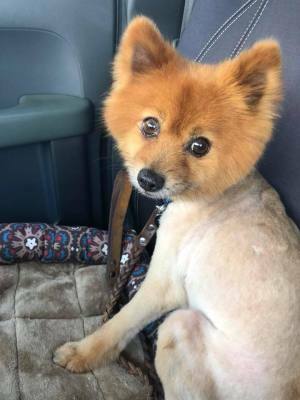 Hasbrown is an 8 year old, 10 pound Pomeranian. When we rescued him from VCAS he had been hit by a car and had a lacerated tongue and knee injury. He is healed up and ready for a forever home of his own. 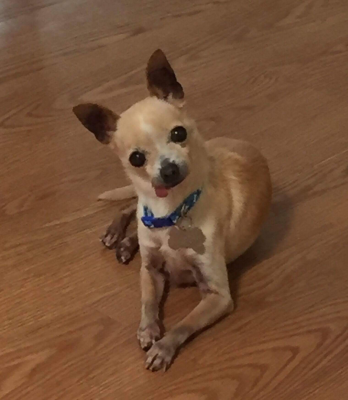 Pepe is a 6 year old chihuahua with a very funny little personality. 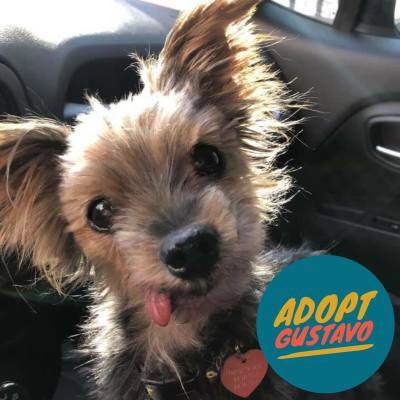 He is sweet and likes to sit on your lap but also likes to play with toys and hang with other dogs. He is a very fun little dog and has so much character!! He does get a little possesive with his food with other dogs around but does well when fed separately and a home with no cats would likely be best. And yes he came to us missing one eye, but it doesnt slow him down in the least, only makes him more handsome!! 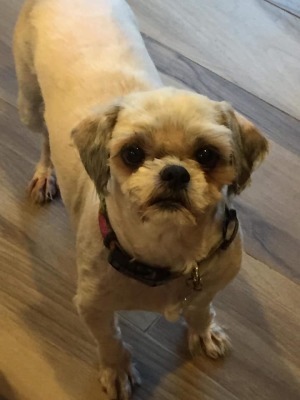 Gracie is a beautiful little 8-9 year old shihtzu. The day we met her she was the only quiet dog in the medical room at the shelter and stood on her hind legs with little praying hands like she was begging. I could not forget her and had to go back and bail her out. 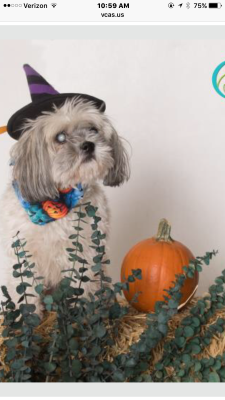 Gracie is very healthy but happens to be mostly blind due to cataracts. This does not slow her down at all and she is a very confident dog. She lives with other dogs in her foster and gets along well though she sometimes tries to ward them off with a bark to protect herself, likely a protective mechanism due to the blindness. She would make a wonderful companion for someone with a fairly quiet home. She is a special girl and hoping someone will see past the blindness to all she has has to offer!!! 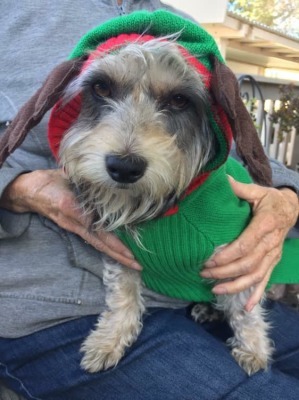 Capone is the most adorable little 12 year old senior rescued from Ventura County. he had very severe dental infection and all of his teeth had to be extracted. He felt better right away and is so adorable with his toothless litle smile. 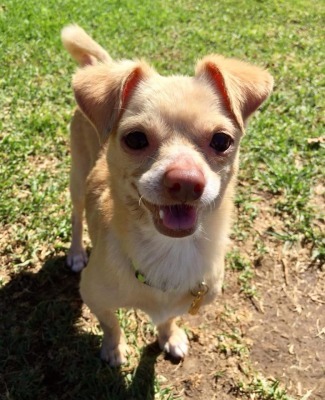 He is a very happy little guy who walks well on leash and is social with dogs and people. He is looking for his forever family and looking forward to several more good years!!! 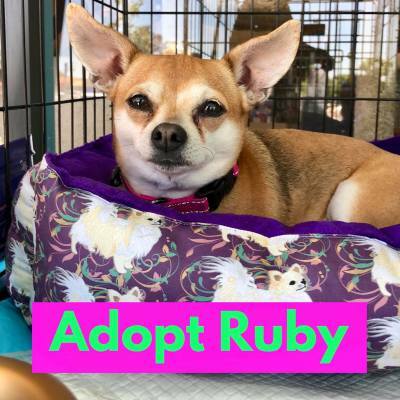 Meet Ruby! I'm 3-4 years old and 10 pounds. I'm a beautiful Chimix girl looking for my person. Could that be you? Ivy is such an amzing sweet loving girl!! 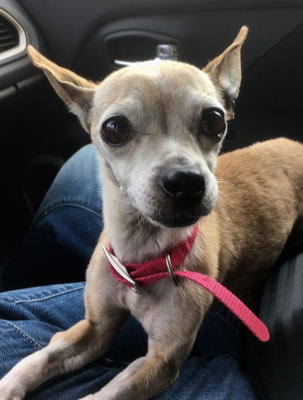 She is about 8 years old, rescued from Ventura County. She waited 2 long months in the shelter and we just cant figure out why!!. She is extremely well behaved and walks nicely on a leash. She gets along well with other dogs. She wants nothing more than to cuddle up on your lap. Ivy deserves her own person to love and she is just waiting!! Could it be you??? 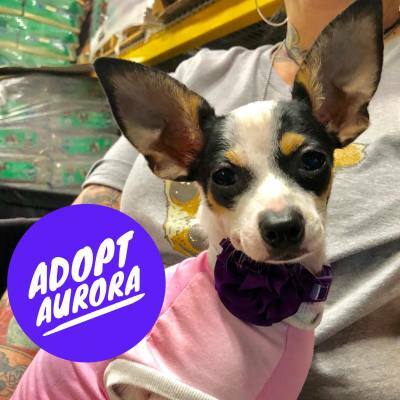 Harmonie is quite a beauty and really looks like she is a chihua mixed with Italian Greyhound. She is only 2 years old and in great health. She has the most adorable little prance when she walks. She can be a little shy at first but warms up quickly. She is very affectionate and good with other dogs. She walks beautifully on a leash and enjoys going to the park or out and about with you. She is a very happy little girl and looking for her special forever family. Azalea is just waiting to steal your heart!! She is a super affectionate tail wagging little lovebug. She wants to be on your lap and in your arms as much as possible. She is 9 years old, has had bloodwork and a dental cleaning and is ready to meet her special someone!!! Opal is one of the two beautiful puppies that came in with Ruby. They have been such a joy to watch grow. Very healthy little chubby girls. 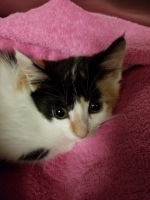 Opal is spayed and has her vaccinations and ready to go to her forever home!!! Jewel is the second and smaller of Ruby's beautiful girls. Just too cute for words, she will be spayed as soon as he is of the proper weight and will be ready to go. How can anyone resist this face? Meet Abigail! 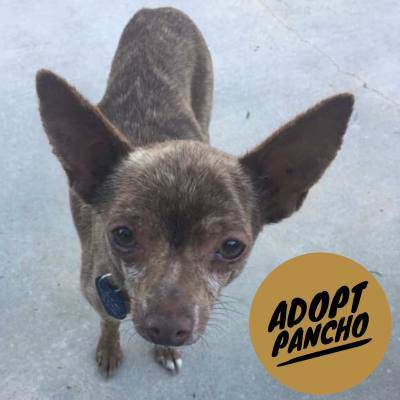 She is a darling 1 year old Chihua mix that came from a high kill rural shelter pregnant. She gave birth to 2 puppies shortly after arriving but sadly they did not survive. She is very affectionate, loves to sit on your lap and great with other dogs. This girl deserves a stable happy life now. Buttercup is another dog we rescued very pregnant. She gave birth to her puppies mid-February. This little family including mama will be available soon. Stay tuned! These are Buttercup's terriermix puppies who have found their forever homes. Happy lives little pups. 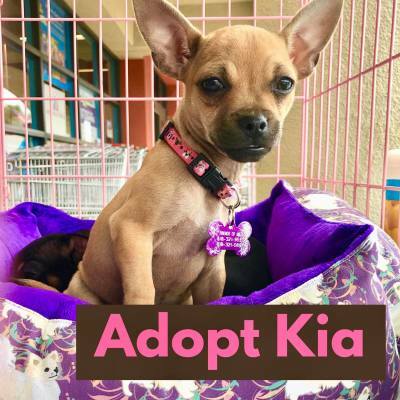 Araia and Hannah are Chihuahua/terrier mix puppies born in mid September 2016. They were thrown in a dumpster by a woman tied in a trash bag. Avery nice lady saw the woman put the bag in and when she threw her trash away she heard crying and rustling. Her grandson climbed in with a flashlight and pulled out the bag with these girls inside with their eyes still closed. This kind lady and her grandchildren bottle fed them and did a great job. Their landlord found out and said they had to go immediately, which is where we came in. We have had them vaccinated and they are getting spayed and will be available for adoption by the end of November. Please fill out an application for these adorable sisters if you are interested!! 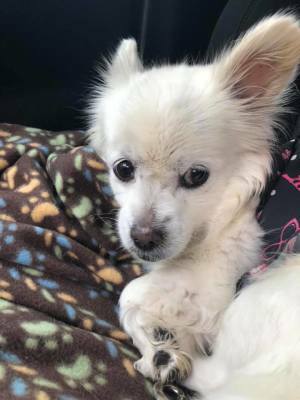 Faith is an adorable little senior Pomeranian who was abandoned in an empty house when her previous owners moved away and decided she wasnt worth taking. 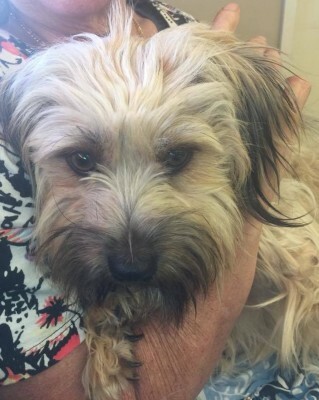 Left to starve, she was reported by a neighbor and confiscated by the San Bernardino shelter. She had to wait in the shelter for a month before being released for adoption. Her story really got to us and we had to save her!! 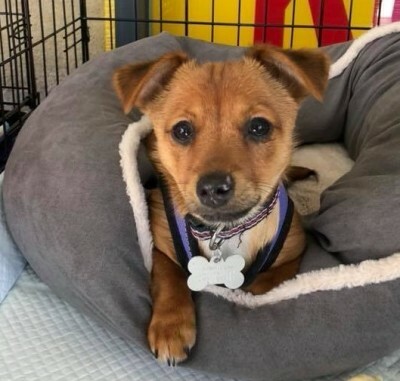 Her first day out of the shelter really WAS her lucky day, as the moment she arrived at my hospital and Dr Sue Downing set eyes on her she was in love!! 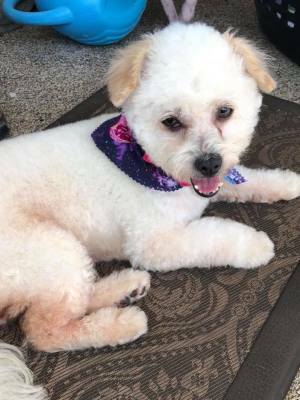 Faith had multiple medical issues which have all been taken care of by her new mom and she has fit into Dr Downings family perfectly!! Truly a match made in heaven!!! This boy was rescued from the shelter and has quite a big personality!! Very playful and curious about everything!! Going to be a big beautiful long haired boy! 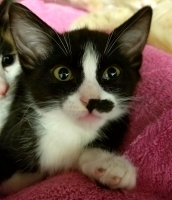 Franny is so adorable and loves attention .She really stands out with her little half mustache. This girl has an adorable personality!! Lily is so beautiful and loves cuddling with Franny!! She is very sweet, a little shy. Would be a great companion for another kitty! !